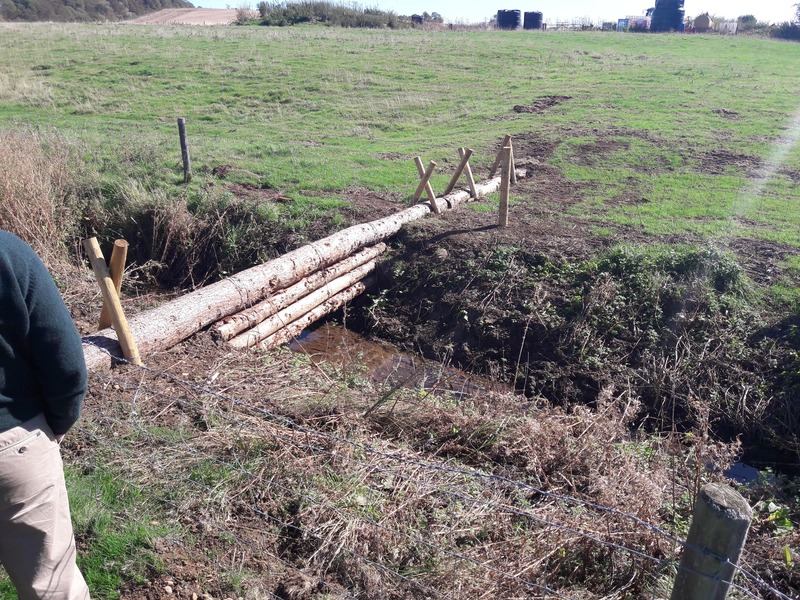 Two weeks ago, some of the RRC team had a day out at the Allterton Project in Loddington, Leicestershire. The Allerton Research and Education Centre, supported by the Game and Wildlife Conservation Trust is the hub for demonstrating this project, and disseminating information on agri-environmental issues to interested parties including farmers. Starting at the visitor centre in the morning, Chris Stoate, head of the research, gave an engaging presentation on what the farm does, why the research is needed and what methods have been used across the farm to help manage the land, water and soil. 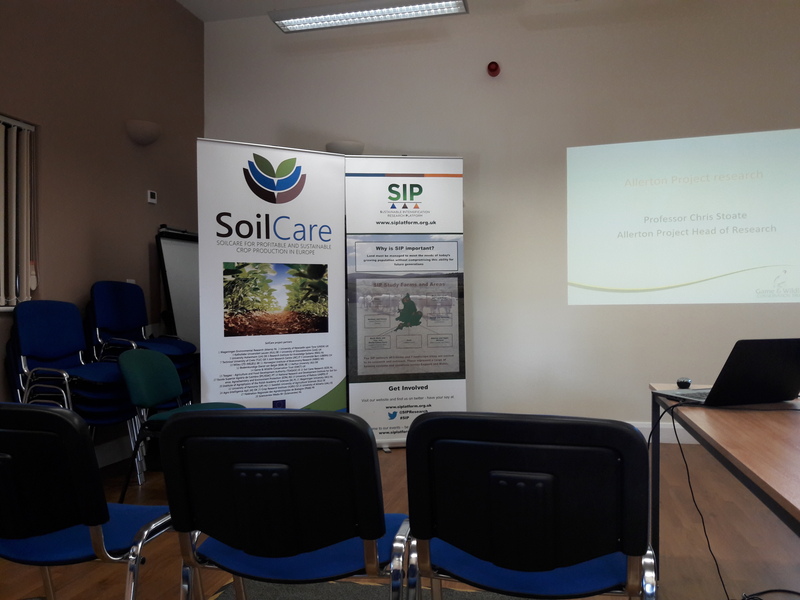 The main research areas covered include how soil water capacity is central to catchment management, and the importance of farmer engagement in the Water Friendly Farming scheme. The techniques used across the farm offer benefits to both ecosystem services and society. Following the presentations and illustrations of the research, a quick networking lunch gave the chance to catch up with other interested participants, before heading out onto the farm in the afternoon to have a look at some of the methods Chris uses across the landscape. The group stopped to have a look at the demonstration dams built as Natural Flood Management techniques, discussing the options for designing these structures, finding and funding materials, and construction methods. We walked beside the fields, stopping to look at a silt pond which collects sediment that is put back on the land, to recycle this sediment and avoid it entering watercourses. 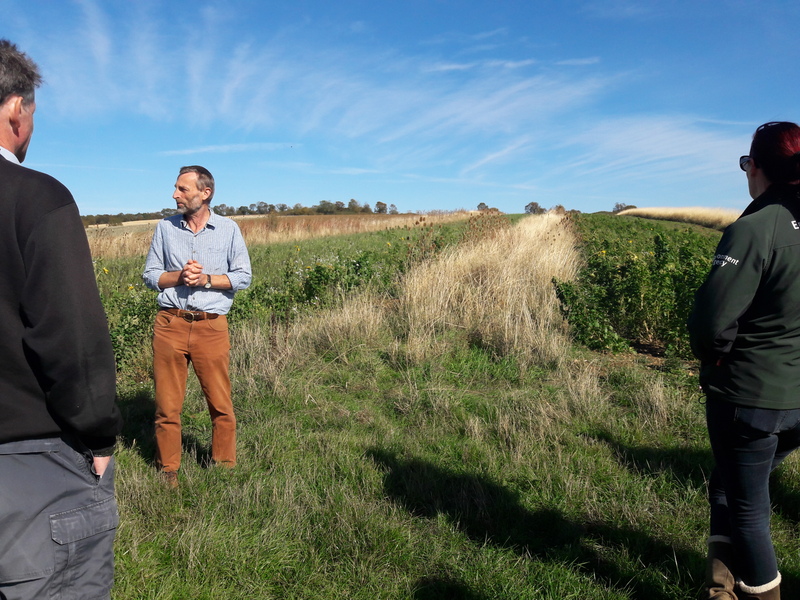 Also on the agenda was a ‘no tillage’ field where the sediment is not being disturbed by farming machinery, therefore more water is absorbed by the soil, helping to generate less runoff. Reducing tillage frequency will help improve stability, structure and therefore function of soil profiles. Another field of interest was where trees had recently been planted, with animals also grazing on the land. Trees can provide a number of benefits including binding the soils through the root structure to help avoid soil erosion and further runoff; as well as a shelter and wind protection for animals. Chris continued the tour of the farm, showing us the beetle banks and meadow strips of mixed wildflower. The group discussed this Water Friendly Farming technique, aiming to reduce nutrients reaching water courses, for both terrestrial and aquatic biodiversity benefit. One consideration was the location of such meadow strips, and how the orientation of ploughing has a huge impact on field runoff. Heading back to the visitor centre, we were shown the bio bed for cleaning farm equipment to prevent spreading of pesticides across other fields and watercourses, and causing contamination. The visit as a whole outlined the importance of monitoring and research in soil management, plus monitoring at two scales – the landscape scale within the catchment including quality of ditches, ponds and streams; as well as monitoring at the base of the catchment to see what outputs and runoff are being generated through the farm. It was great to get out into the field and the sunshine stayed out for us throughout the day. Thank you to everyone involved in organising and running this event. 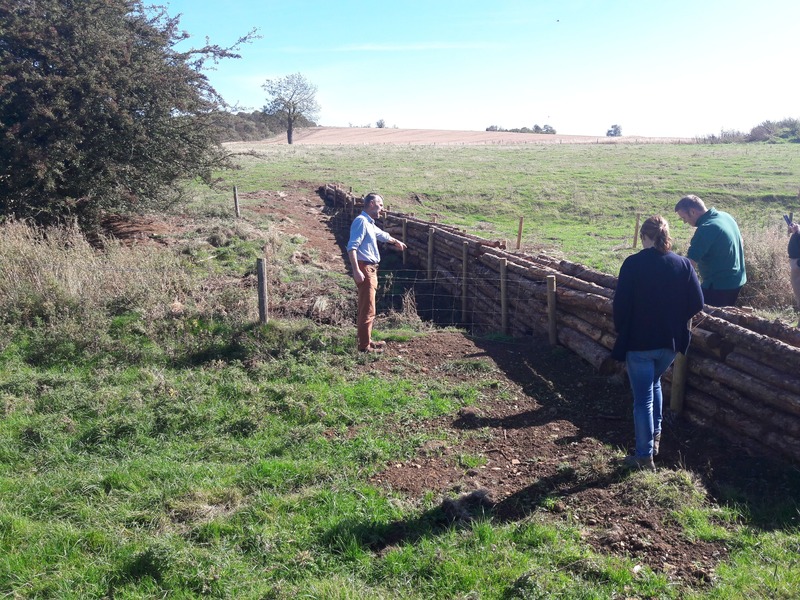 This visit was funded by the Upper and Bedford Ouse Catchment Partnership (UBOCP), who bring together over a dozen partners all working towards improving habitats, biodiversity and water quality in streams across Bedfordshire.